Suspending belief in order to believe is a practice to which we commonly subscribe, even when presented with empirical evidence to the contrary. This has become all the more prevalent in the so-called “post-truth” world of certain sectors of the political elite. Whilst this practice of choosing to believe can be found across all forms of mediation and traced back to the origins of storytelling, it is ostensibly essential to the experiencing of filmic realities. The work in this exhibition is an attempt to question such acceptance. STOP. STOP. STOP. brings together works by Colin Darke, Peter Richards and Peter Spiers for the first time in a discourse addressing the construction and function of the moving image, each artist adopting a distinct approach and employing characteristics associated with “labour”, “improvisation” and “through doing”. The exhibition is an examination into the ways that film and animation blur cultural distinctions between reality and illusion. Colin Darke’s piece, titled Parodos (2010), consists of sixty paintings of film stills which, when installed, are used to create an animated re-presentation of a short film featuring the delivery of a speech by Russian revolutionary leader Vladimir Lenin. The work very physically and laboriously unpicks the very premise of moving image, drawing on the drama theories of German playwright Bertolt Brecht. 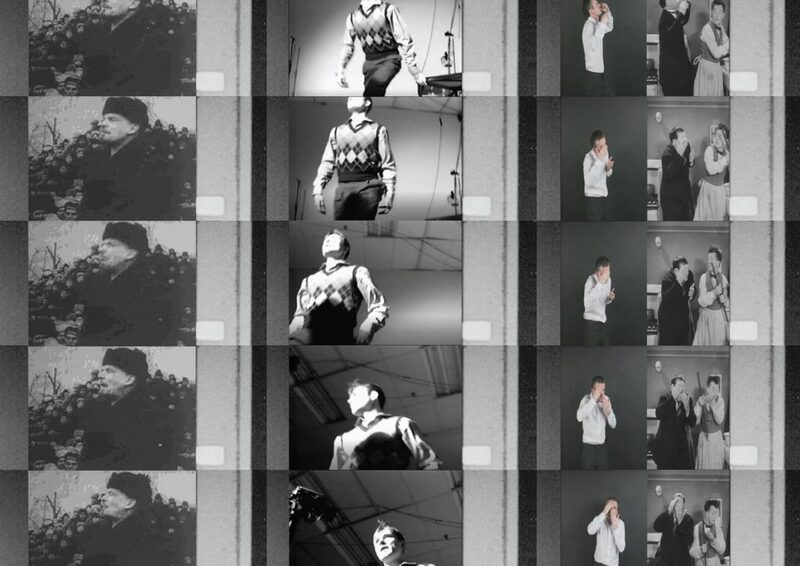 Peter Richards’ Untitled: Live Video Interaction Exercise 1 was first created in 1996. In the first of its two parts, the artist attempted to do “nothing” in front of a live audience, while being filmed by three separate cameras. The second part saw Richards attempt to mimic the edited video, to a single fixed camera. The result was an unexpected form of improvised slapstick dance. For Stop. Stop. Stop. Richards will revisit the work and create a new ‘Untitled: Live Video Interaction’, in collaboration with D.A.S., during the opening night, with the resultant video installed for the remainder of the exhibition. Peter Spiers specialises in performative imagery, exploring new ways of imaging that go beyond representation methods and place the image in the immediacy of its encounter. His video Mimicking Frame by Frame explores Heidegger’s philosophical concept “Dasein”, the state of “being through doing” specific to human experience. The artist presents an action which acutely mimics that of the actor Oliver Hardy as he performs a series of slapstick gags. Original footage is reconstructed by Spiers which compels the viewer to reconsider the act of looking. The exhibition is kindly supported by the Arts Council of Northern Ireland, Digital Arts Studios and Golden Thread Gallery.